Weaver’s Wildlife Control gets calls all the time from Virginia Beach residents about foxes living underneath their homes and decks. Healthy foxes in the wild are an important part of our natural ecosystem. The Red fox is the most common of the foxes native to North America. The Red fox is dog-like in appearance, with an elongated pointed muzzle and large pointed ears that are usually erect and forward. Foxes have moderately long legs and long, thick, soft body fur with a heavily furred, bushy tail. Red foxes are colored with a light orange-red coat, black legs, lighter colored underfur and a white tipped tail. Red foxes weigh between 7-15 pounds, with males weighing 2 pounds heavier than females. The Red fox is highly adaptable to most habitats. Red foxes are Carnivores and opportunists, feeding mostly on rabbits, mice, bird eggs, insects, and fruits. They usually kill animals smaller than a rabbit. The Red fox has keen hearing, vision, and sense of smell all to aid in detecting prey. They will stalk even the smallest mice with skill and patience. This stalk usually ends with a sudden pounce onto the prey. Red foxes will sometimes kill more than they can eat and bury food in caches for later use. Foxes even feed on carrion (dead animal carcasses) at times. Red foxes are crepuscular animals, being most active during the early hours of darkness and very early morning hours. They will even move about during the day, especially when it is dark and overcast. Foxes are solitary animals except from the winter breeding season through midsummer, when mates and their young closely associate. Red foxes have a wide variety of calls. They may bark, scream, howl, growl, yap, and make similar sounds to a hiccup. Red foxes will dig their own dens or use the abandoned burrows of a groundhog. The same dens will be used for several generations. Foxes use their urine and feces to mark their territory. Red foxes mate between mid January to early February. Red foxes generally produce 4-9 pups. Rabies outbreaks are most prevalent among Red foxes in the eastern United States. 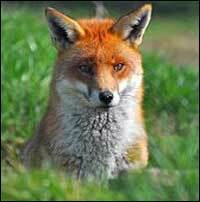 Rabid foxes are a threat to people, domestic animals, and wildlife. Foxes are vulnerable to and can transmit a number of serious zoonotic diseases including rabies, mange, distemper, parvovirus enteritis, roundworms, and other Endoparasites. They also may be involved in the transmission of Arboviral diseases vectored by fleas, ticks, and other external parasites that commonly infest wild animals. Foxes with mange (skin burrowing mite) begin losing their hair, scratch furiously and scab over resulting in a long slow death. This is transmittable to other fox and domestic dogs. Foxes in a weakened state, due to disease or injuries, may not respond to human stimuli, will tolerate a greater level of human activity, and will seek out the easiest possible meals, including unattended dog and cat food bowls. These same foxes will readily take shelter in barns, sheds, and under porches. 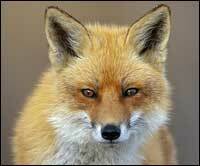 Red foxes have adapted highly to urban areas and altercations with people and pets are very common. Foxes make people feel very uncomfortable. Foxes that appear disconnected, unaware, aggressive, unresponsive and threatening should be regarded with extreme caution and Weaver’s Wildlife Control should be called immediately. Sometimes its not really necessary to trap fox. We can provide proper sanitation techniques to remove attractants and provide construction of secure fences, pens, and coops to exclude foxes and protect livestock. In some cases, fox trapping may be necessary, especially when fox populations are considerably high, natural food sources are scarce, and fox are under increased pressure to find food. We provide expert fox exclusion services all throughout the Hampton Roads area. Weaver’s Wildlife Control is ecologically responsible, ensuring that only environmentally sound solutions and humane wildlife removal techniques are used for all Fox removal situations.